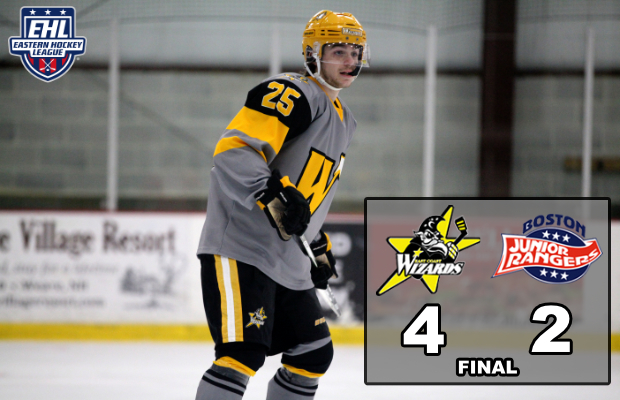 BEDFORD, MA -- The Wizards picked up three big points against the Boston Jr. Rangers and Walpole Express this week, beating the Rangers 4-2 on Wednesday and losing to the Express 4-3 in overtime on Thursday. With the points the Wizards move to 24-15-2 on the season and are now just five points behind the 2nd place Express, and eight points behind the 1st place Rangers with nine games remaining. "Those were two very hard fought hockey games," said Wizards head coach and general manager Freddy Meyer. "It would have been huge to get all four points, but we still gained a lot from picking up three. We will get the Rangers one more time in a couple weeks, and then maybe we will run into either of those teams in the playoffs. If we do, we know it will be a battle." On Wednesday, both Devin Panzeca and Dylan Schuett scored late in the 1st period to put the Wizards up 2-0 at the break. Andy Sommerville then put home his first power-play goal of the season to give the Wizards a three-goal lead with just under eight minutes left to play in the 2nd period. The Rangers responded with a goal near the end of the frame to cut the deficit to two goals. The 3rd period intensity cranked up when Korbinian Lutz denied a penalty shot halfway through the frame, and kept the lead intact for the remainder of the game. After a Schuett empty-net goal and a last second Rangers tally, the Wizards went on to beat their division rival for a third time this season by a 4-2 score. Lutz had the Rangers number yet again, stopping 36 shots in the winning effort. With the two goals Schuett extended his goal streak up to six games and point streak up to an impressive 12 straight games. Shifting gears to Thursday, the squad returned to The Edge to host the Express in an afternoon matchup. The Express got out to an early lead with a goal in the first two minutes of the contest. However, Alec Deluca buried a tally of his own on a 2-on-1 opportunity in the final minute of the frame to knot up the game at a goal apiece. The Express took the lead back on the power-play in the 2nd period and carried a 2-1 lead into the final period. It only took 11 seconds in that final frame for Panzeca to tie up the game for the Wizards on the power-play. The EHL Forward of the Month scored yet again, this time short-handed, to give the Wizards a 3-2 lead. However, the Express would respond less than two minutes later on the power-play to tie the game up once again. 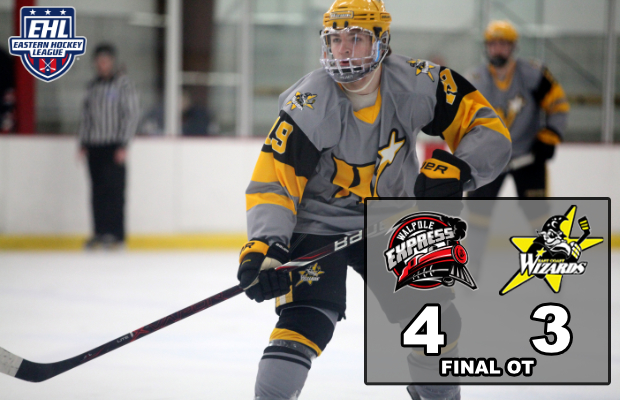 After a scoreless rest of the period, the game went into overtime where the Express capitalized on an odd man rush to win the game with 53 seconds left in the extra period. Jordan White made 31 saves in the losing effort, and despite the loss, Panzeca was able to extend his point streak up to a league-leading 13 games. The Wizards will get back to work with a busy week ahead of them starting with a game in Vermont against the Lumberjacks on Monday. Monday's matchup will be followed by a home-and-home series with the New Hampshire Avalanche on Wednesday and Friday.